Einstein's brain was saved after his death, and became a strange and morbid piece of scientific memorabilia. It changed hands several times before it came to rest - squared. What became of Einstein's brain? First of all, not what he wanted. Einstein specified that he wanted his body, with his brain inside it, to be cremated. But with fame comes consequences. Thomas Harvey, the pathologist on call at the Princeton Hospital, where Einstein died, claimed that he was told that the hospital had permission to perform an autopsy, but no evidence of such permission was ever found. The brain was removed, photographed, and preserved. Harvey saved his job by getting retroactive permission from Einstein's son, with the understanding that the brain would be saved for scientific inquiry, but lost it several months later for refusing to turn over his specimens to any other actual scientists. Dismissing Harvey didn't get Princeton the brain. Harvey absconded with it to another hospital, where technicians sectioned it into cubes. He then studied it for the next forty years, always announcing that he was close to conclusions. During these decades, the brain had many more adventures. The brain, in cube form, was the subject of a marital dispute when Harvey divorced his wife. (She came close to destroying it completely.) The brain was gawked at by beat poet William Burroughs, Harvey's neighbor, and then dumped in the trunk of Harvey's car to make a cross-country tour to Einstein's granddaughter, who didn't want it and was reportedly annoyed when Harvey left it at her house by mistake. At last, Harvey went back to Princeton, and returned it to the very hospital he'd taken it from in the beginning. While Harvey was making these journeys, he was sending the brain off to anyone who would study it. Harry Zimmerman, Harvey's mentor, owned about a sixth of the brain. Marian Diamond, a researcher at Berkeley, got about four blocks. Burroughs, the poet, liked to say he could get a piece any time he wanted, but never did. Dr. Diamond found, after some study, that one section of the brain had more glial cells, support cells for neurons, than other brains, but her study showed no other marked differences. The results were especially suspect, since the area studied had more to do with speech than anything else. Einstein was known to have started speaking relatively late and was linguistically not on the same level as fellow students in his very early years. Later research showed that the study itself was so riddled with problems that it was largely discredited. 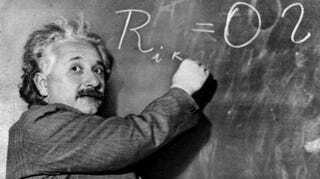 Another study, after gaining another piece of brain and the photos of the original whole brain, concluded that Einstein had a greater than average number of folds on the outside of his brain. He did, however, have a smaller than average brain. It was also wider than average. None of these things provide much more insight into his genius. How could it? A study of one genius's brain can't give consistent results, because there is no other genius to compare it to. In fact, most of the researchers contacted by Harvey had no interest in studying the brain at all. And what did Einstein have to say about his oh-so-brilliant mind? He's noted for saying a lot of things, including, "The contrast between the popular assessment of my powers and the reality is simply grotesque." He was uncomfortable with the idolatry he received during his life, and feared it would be worse after his death. (Think about that, everyone who had an Einstein poster in college.) One of the reasons that he wanted his body cremated whole was so his ashes could be scattered in secret, and no flocks of scientific pilgrims could gather at his tomb. In some ways, the saga of his brain would probably have left him appalled. In others, though, it might have been what he wanted. That many road trips, the sordid struggles for ownership, the rejections, the published and shredded papers, and the scattering of pieces have taken much of the power out of the myth. There is no one place to go to gawk at Einstein's brain. It has been taken apart too thoroughly. Now Einstein's eyes are another story. Harvey removed them too, and they are still floating in a safe deposit box in New York somewhere. Isn't that a cheery thought? Via NPR, Damn Interesting, and Neuroscience for Kids.